It's not surprising that Democratic Party officials are reaching far down into their bench for someone to respond to President Donald Trump's State of the Union Address. When they last selected a candidate for president, Hillary Clinton -- the former senator from New York and former secretary of state -- lost to Trump. Something new is needed, and they are asking Stacey Abrams, the former minority leader of the Georgia House of Representatives, to do the honors. Abrams lost the governor's race this past November to Republican Brian Kemp. This is the first time that a former elected official will be the stand-in for the Democratic Party. Recent responders include Rep. Joe Kennedy, D-Mass. ; Gov. Nikki Haley, R-S.C.; Sen. Joni Ernst, R-Iowa; Rep. Cathy McMorris Rogers, R-Wash; and Sen. Marco Rubio, R-Fla.
Abrams is a fantastic candidate and dynamic speaker -- the opposite of Clinton. She might be a great pick -- if she were not so extreme in her policies. But then again, this puts her in line with the left wing of the Democratic Party. Last fall, Abrams used the topic of potential voter suppression to energize Democrats. Who gets to vote, how registrations are processed and how voters get to vote are important topics. For instance, in November 2016, San Francisco voters passed Proposition N, which gave noncitizens the right to vote in school board elections. Personally, I am against giving noncitizens the right to vote. 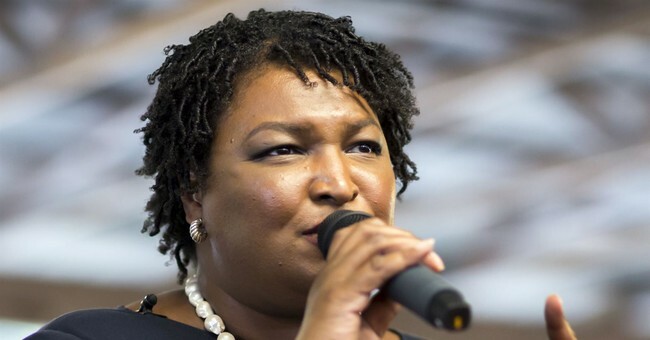 During her campaign, Abrams weaponized voting rights to drum up media and money. She has also been seeking to represent noncitizens, as evidenced by her website, which states, "I do mean everyone who resides in our state ... (including) new Americans, naturalized citizens and all those on the long, arduous path toward citizenship (illegally here or not)." After losing in November, Abrams was interviewed on Jan. 11 by Margaret Hoover for PBS' "Firing Line." Hoover asked, "In some cases, you would be supportive of noncitizens voting?" Abram's responded, "I wouldn't oppose it." During the Georgia governor's race, Kemp focused on a theme of "Georgians first." Abrams' claim that Kemp suppressed voters dominated national headlines and drove media and money into the race. To be clear, I believe that everyone who has a right to vote should vote -- and that voter integrity is important. We have to ensure only voters who have the right to vote are counted. It's fascinating because during Kemp's tenure as secretary of state, the number of registered voters doubled for Hispanics, increased 81 percent for Asians and increased 11 percent for African-Americans. During the same time period, the number of white registered voters declined by 1 percent. When faced with those facts, the argument shifted to voters being removed from the rolls due to a 2017 matching law and a 1997 "use it or lose it" law that was passed in Georgia -- overwhelmingly, by Democrats. Still, despite these two laws, registrations of minority groups rose in Georgia while the number of registered white voters fell. The next argument: that the lines in precincts were too long and the locations were hard to reach and had been reduced. While those assertions might have been true in some places, in Georgia, staffing and locations are controlled at the county level. During her campaign, Abrams brought in national Democratic figures, including former President Barack Obama, Sen. Kamala Harris of California, Sen. Cory Booker of New Jersey, Sen. Elizabeth Warren of Massachusetts and former Attorney General Eric Holder. But the star power and the money that poured in from out of state were not enough to push her over the line. Gaffes made by Abrams and her guests may have made a difference. While campaigning with Warren, Abrams was caught on tape talking about her win: "The blue wave is African-American. It's white. It's Latino. It's Asian-Pacific Islander. ... It is made up of those who have been told they are not worthy of being here. It is comprised of those who are documented and undocumented." Abrams attempted to walk back her comments, but her campaign website made it clear she would represent anyone who lived in Georgia, no matter how they got here. In Georgia, at an Abrams campaign event, Holder sought to rally the Democratic troops by saying: "Michelle (Obama) always says, 'When they go low, we go high.' No. No. When they go low, we kick them." The comments garnered headlines, motivating her base and bringing in money, much of it from out of state. (New York and California were big donor states, to no surprise.) But still, she lost. Now, she is taking her show to the national stage with the draw of media and money.